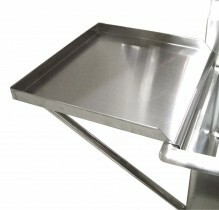 Stainless steel drain boards available to increase the functionality of your commercial tub sinks. Available in different sizes, these accessories are the perfect addition to increase space in an otherwise small area. Easy to clean, these drain boards provide extra workspace when it is needed!